In my childhood I have a favorite dishes my mom usually made. Luckily, my wife still remember the recipe for this dish, so I gone to local market first thing on the morning. I found out that cassava leaves has a several kind to choose, so I must pick the right one which will be tendered after cooking. Wash the Cassava leaves firmly, add some salt and mix them well. Sliced Salted fish for 4-5 parts. Chopped the Spices, then put into a bowl, add salt, sugar and seasoning. Mix them well. 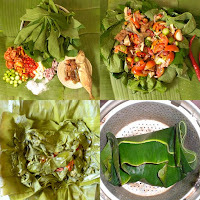 Put most of the Cassava leaves on top of Banana leaves, then put the mixed spices and salted fish. Cover it using the rest of Cassava leaves, and then wrap the Banana leaves. Steam it for 1 hour. After the dish is well cooked, serve it with warm rice.